In 2016 Tim Hall had the great idea to introduce the ‘OTN Appreciation Day’ where bloggers should write a short blog about their favorite Oracle feature. This year’s name is ‘ODC Appreciation Day’ as Oracle rebranded the community to Oracle Developer Community. As last year the question is which was or is the feature you like best? The Cloud User Experience Rapid Development Kit is available for a couple of years already, but with version V13 of the RDK we get a new look and feel representing the current SaaS Applications look. 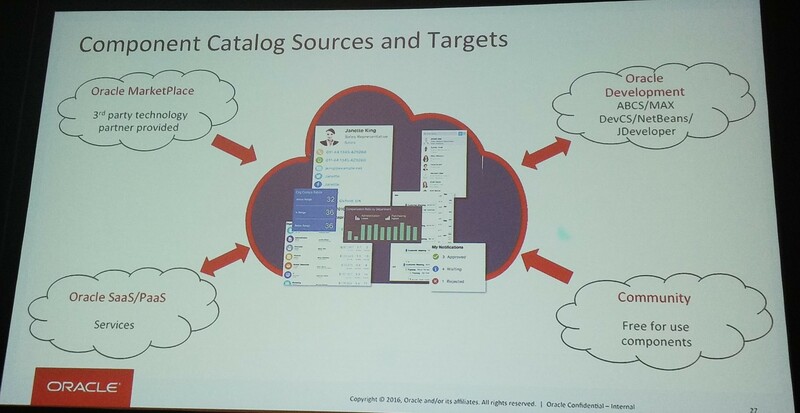 The RDK give developers and designers a tool to quickly design and program applications which are looking like Oracle’s SaaS Applications in the cloud. But wait, an RDK for JET is in the pipeline. The OAUX Team presented the JET RDK before the OOW to selected partners and ACE Directors. It should be available in the near future. As you see there is almost no difference. You develop your application in and get the same look and feel regardless of the technology you use. 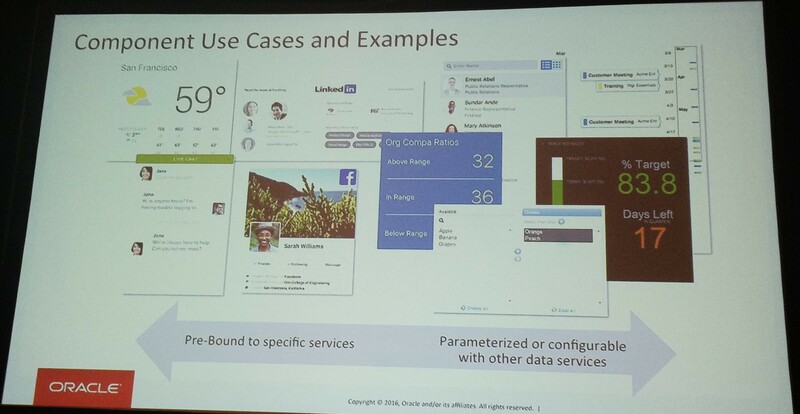 Finally, to round things up, Oracle provides an RDK for Conversational UI – or actually the first half of the RDK – the part that deals with designing the conversational UI. Conversational UI for the enterprise adds to and maybe replaces the current Web&Mobile UI – for quick, simple, mini transaction and smart capture. provide recommendations and guidance to users (decision making). The part about the actual implementation will follow with the launch of the Oracle Intelligent Bot Cloud Service. Last week I attended DOAG Konferenz & Ausstellung in Nürnberg Germany. The DOAG (Deutsche ORACLE-Anwendergruppe e.V.) is the biggest German Oracle user group. 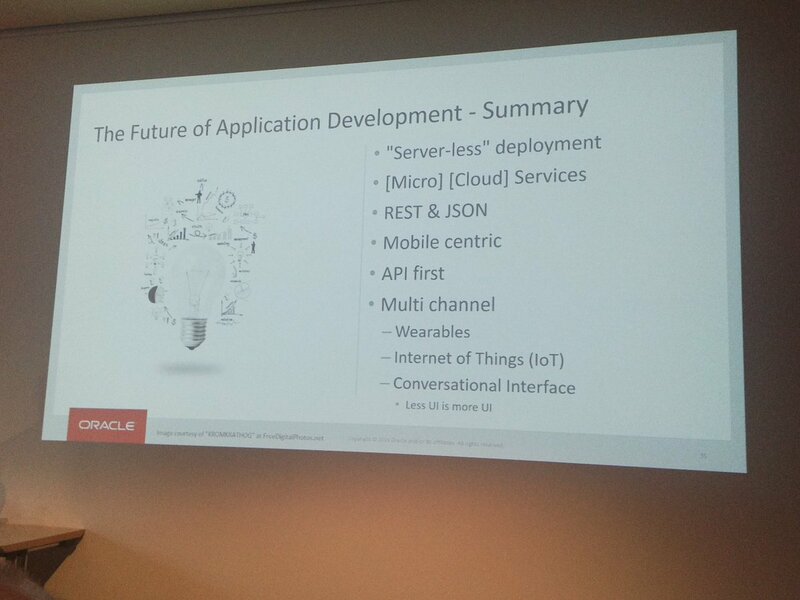 The conference covers all Oracle products and technologies, way too much to name them all. As my personal center of gravity is middle-ware and here ADF and the surrounding technologies, I attended lot’s of sessions about middle-ware, cloud, ADF, MAF and JET. The big picture of Oracle becoming a cloud company is getting clearer. The way developers currently are working on premise with their products migrating to the cloud is getting clearer. There where about 4-5 sessions which gave explicit advice when to use which technology and what problems might arise mixing them. I’ll cover the main three here. Transaction and Services: here you have to check if your services and data model can support a stateless model. Same for your UI which handles the interaction with the user. One thing to note too is that using JET will produce less client – sever traffic. Summary is that there are plenty of reasons not to mix ADF and JET. If you want to mix ADF and JET in a project you should stick to module level and not mix them on one page. The decision for ADF or JET should take these points into account. 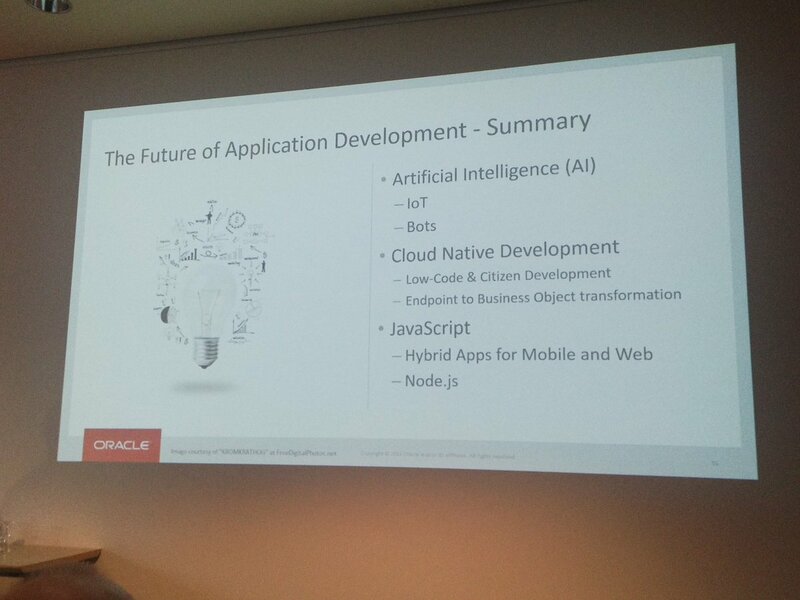 Shay Shmeltzer attended the German Oracle (ADF) Developer Community meeting on the DOAG and we ask him to talk about this topic ‘The Future of Developer Frameworks’. meaning that ADF allows development in all tires (MVC) whereas JET is only a client technology. Using JET you still have to have a back-end which generates the needed REST services. Here ADF comes into the picture again. 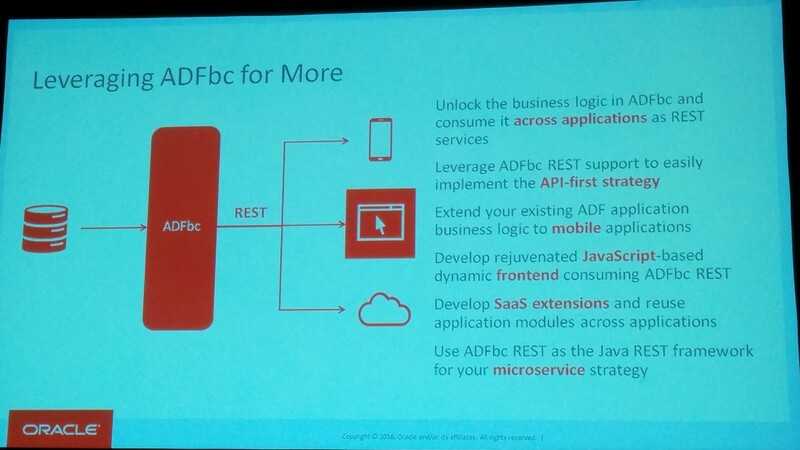 True, building a REST service from an exiting ADFbc model is very easy and allow shaping the service too. 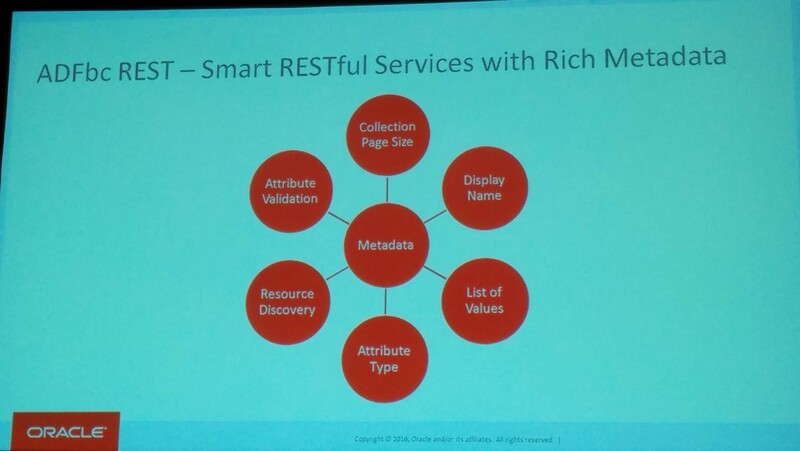 Besides ORDS (Oracle REST Data Service, a tooling which allows to develop modern REST interfaces for relational data in the Oracle Database ) this is the easiest way I know. 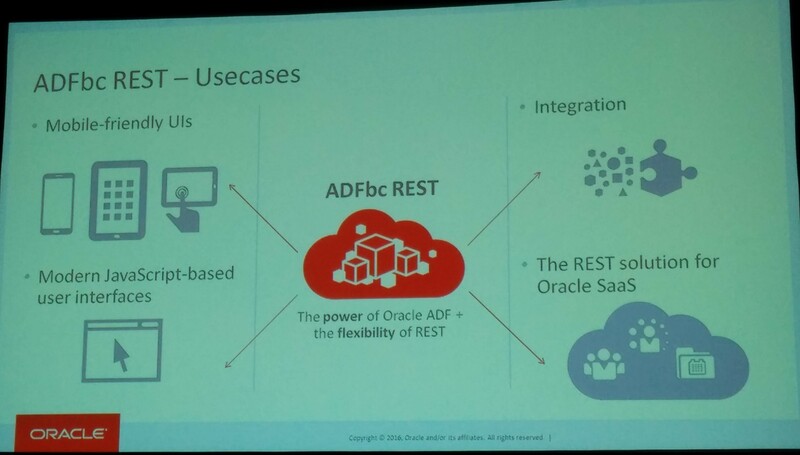 Oracle is using ADF heavily in the SaaS products and will going on to do so. There are areas where building UI with JET is preferred (not in SaaS), but here the points mentioned by Duncan Mills are always considered. My personal opinion is that ADF is alive will be used in the future, but there are options now which allow developers to choose different technologies in certain areas. Using ADF in the model layer and working with relational data bases, create REST or SOAP services with ease is a big plus. For the UI there are use cases where JET will be used, but ADF has its share too. Today October, 19th 2016 JDeveloper 12.2.1.2 was released. From the first look at it it’s only a maintenance release. There is currently no ‘What’s new’ document, only a release notes are available. Another change in the REST department is that adf date and datetime attributes are no longer described as string but as date and datetime. Interesting if you work with ADFbc and Oracle JET. There are some other small bug fixes and deprecation’s of oracle.domain data types and the dvt:stockGraph. You should use dvt:stockChart instead. Wednesday was a somehow slow day for me as I attended two sessions only. Most of the day was reserved for meetings around my other activities in the OTN network like moderation and the German ADF Community which will soon relaunch their community page on OTN. The first session was about testing web applications with Selenium ‘Testing Java Web Applications with Selenium: A Cookbook‘ by Jorge Hidalgo and Vicente Gonzalez Arellano, over at the Java One. It turned out that the Selenium Webdriver for JDev ADF is better working than the one showed in the demo in this session. The JDev Webdriver abstracts all the tricky stuff like waiting for ajax calls or finding the right component away from the developer. This make the job really easy. Summary: nothing new learned. During run time you can tailor the payload by only retrieving the attributes you need, execute batch transactions, sort the results and have build in security. like back end for OracleJET based applications, mobile friendly UIs, integration with other services and as REST solution for SaaS. The remaining part of the day I spend on multiple events like hte OTN Blogger Meetup, OTN Happy Hour and finally the Oracle Appreciation Event featuring Sting and Gwen Stefani. Started with the (early) morning keynote ‘Oracle OpenWorld Tuesday Morning Keynote‘ hosted by Bhanu Murthy B. M., Safra Catz, Hon. Chief Minister Shri. Devendra Fadnavis and Thomas Kurian. As the keynote and it’s content is covered all over the media already I won’t add to this. Oh, one thing I like to say is that the ‘live’ demos did not really look live to me. Would you risk that your ‘live’ demo is going to hell because of some technical problem with Thomas Kurian on stage? Next on my list for today was ‘Agile Development and DevOps Done Even Faster with Oracle IaaS and PaaS‘ by Michael Lehmann, Suhas Uliyar and Siddhartha Agarwal. This session talked about agile development in the cloud using IaaS, PaaS and Microservices together with DevOps tools like Docker. The practical part was a sample which showed how to build, deploy, or manage mobile-fronted, API-first autoscaling application, a microservice build on Node.js here, live on stage. New here is htat you can use the Management Cloud Service to introspect the microservice to see how it runs on your environment. The just build service then is consumned by anohter app (mobile using MAX) to visualize the data. Next on my Cloud program was ‘Development Operations in the Cloud: A Use Case and Best Practices‘ by Greg Stachnick and Jeff Stephenson. They talked about best practices using the Cloud Services to develop applications from the modern DevOps point of view. 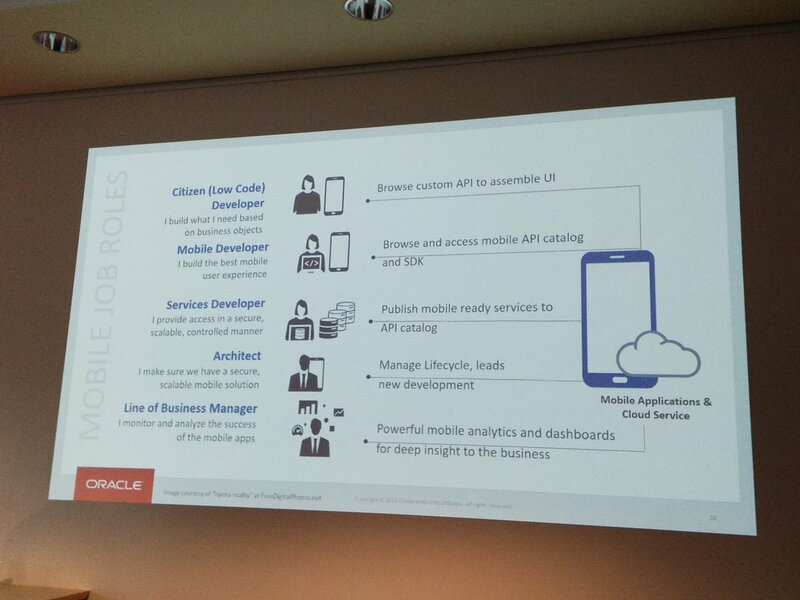 The case study was about the development of the Developers Cloud Service itself, neat! This summary hit the nail on the head. I’ve bin a contractor in many projects, always asking for more machines or more power. I would be happy if I could spin up another machine to do some testing instead of waiting for some other things to finish using the machine I wait for. which is even longer if you count JBO to it too, which started 1999. Impressive. The session was more about features which are new in JDev 12.2.1 and JDev 12.2.1.1, both versions are out quite some time. So, nothing new for seasoned ADF developers at the beginning. Not so well known are ADF Business Components Triggers which are more known by Forms developers. They allow to do things right before or after some DB events fires. For the future we can expect more and easier support for REST services and writing Groovy code. The biggest change will be the integration of JET Composite Components into ADF pages. JET Composite Components are an equivalent to ADF Declarative Components. You can build components from using other components, add properties to them to influence their behavior. Composite Components fire events which you can use to interact. Not sure how this will work, other that in the end you have HTML. Bad thing is that there is not even a time frame for this. More details in hte next section. Anyway, ADF is not dead! 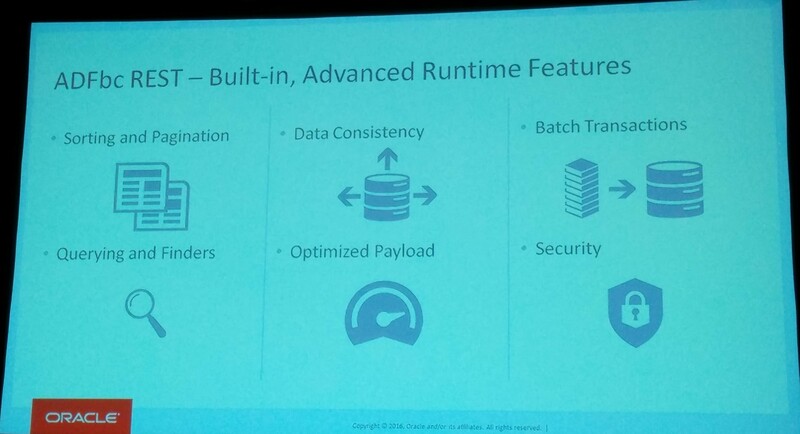 There will be future development and enhancements in JDeveloper and ADF. Shay summarized the different frameworks ADF, MAF, JET and ABCS and pointed out their key features. As the frameworks are well known I spare most details. As promised I give more detail about the Oracle JET Composite Components. 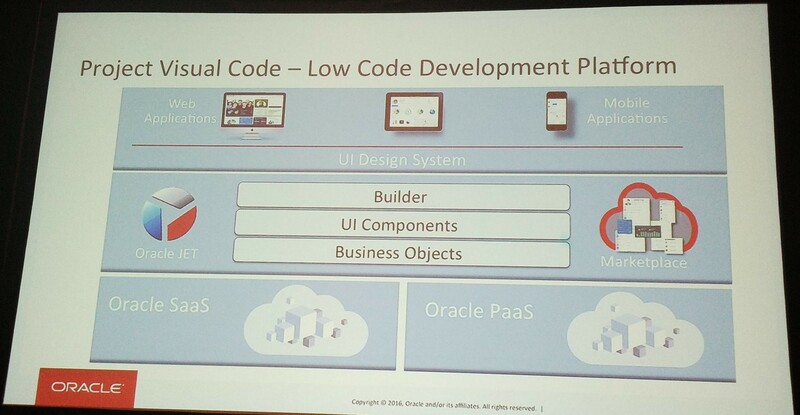 Oracle focuses on JET as the future development environment Future focus on jet. Why? ADF is already feature rich and the developer don’t ask for much more. Developers want more client side development. Demand on server generated UI is going to decline. JET will get offline capabilities! This can’t be done easily with ADF. Public Component Catalog is only public to a point. You have to submit components which then will be vetted by someone before other users can use them. For declarative JET development look at ABCS. ABCS allows to get the underlying JET code (save as) so you can look at the code and change it, e.g. to use it elsewhere.